Brain diversity has puzzled scientists for centuries. But, what do we mean by 'brain diversity'? If one compares brains from many different species of vertebrates, soon one realises how different they look. This diversity in brain form or morphology is extraordinary not only for brains from very separate groups (e. g. mammals vs. fishes), but also within the same group. Take as an example 'ray-finned fishes', a group of fishes with more than 30,000 species and whose members have fins supported by bony spines. Within this group, brain morphology can be very different even between closely related species (see brains in Figure 1). Figure 1. Brain diversity in ray-finned fishes. Simplified schematic drawings of three brains from otophysans (members of the 'Otophysi clade', that is, a subgroup within ray-finned fishes). Top: zebrafish, bottom left: catfish; bottom right: goldfish. Note how different these brains look despite being from relatively close related species. Abbreviations mark some common divisions or regions in the brain: C, cerebellum; H, hypothalamus; MO, medulla oblongata; OT, optic tectum; T, telencephalon. Up to here it is quite simple: brain morphology is very variable within vertebrates. But here comes the difficulty in understanding brain diversity: if one compares many vertebrate brains in depth, it becomes clear that divisions or regions are very similar from brain to brain (Figure 1). So brain regionalisation seems to be highly conserved, while morphology is not. And, to complicate things even more, all brains develop from the same embryological structure: the neural tube. In consequence, some sort of plasticity has to have emerged during vertebrate evolution, so remarkably different morphologies can be generated from the same embryological structure. And this plasticity must operate during embryonic development. So, the big questions are: What is this plasticity about? What developmental mechanisms allow this plasticity? How is all this genetically encoded? In order to understand how brain diversity is generated, we studied in detail the development of the telencephalon of the zebrafish (a ray-finned fish). The telencephalon is probably the portion of the brain that shows the higher level of morphological variation within vertebrates. It is the most anterior portion of the brain, responsible for functions such as emotions and memory. All the big range of telencephalic morphologies are classified into two main categories: ?everted' and 'evaginated'. All vertebrates have an evaginated brain, with the exception of ray-finned fishes (and partially also in the coelacanth) that have an everted telencephalon (Figure 2). Figure 2. Telencephalon diversity in ray-finned fishes. Simplified phylogenetic tree for vertebrates, including examples of members of each group (from lamprey to mouse) and a drawing of one half of its telencephalon in transverse section (top). Only ray-finned fishes (marked with a rectangle) have an everted telencephalon. Everted and evaginated telencephali have very different morphologies (Figure 3). In brief, if we cut a transverse section through an evaginated telencephalon, we would see that there is an internal cavity (called ventricle) surrounded by neural tissue. In an everted telencephalon, it is nearly the opposite situation: the cavity (ventricle) partially 'engulfs' the neural tissue (Figure 3). Figure 3. Differences between everted and evaginated telencephali. Simplified drawings of transverse sections through an everted (bottom left) and evaginated (bottom right) telencephalon. Neural tissue is highlighted in grey and the cavity or ventricle in marked in yellow. The presence of an extended epithelial-like tissue that covers the ventricle dorsally (tc, tela choroidea; in red) is also a characteristic trait of an everted telencephalon. Both telencephalic morphologies originate during embryonic development from the neural tube (top). Adapted from Gage (1893). First, it is crucial the formation of a cavity within the brain: the anterior intraencephalic sulcus (AIS, Figure 4). The AIS consists of an inflated cavity or ventricle located at the caudal pole of the telencephalon. This ventricle has a very specific morphology (described in the paper) and conditions subsequent developmental events. Figure 4. Formation of anterior intraencephalic sulcus (AIS). Time-lapse sequence of a transgenic β-actin:EGFP embryo. The midline lumen opens out at the telencephalic-diencephalic boundary to form the AIS. Inflation of the ventricular space leads to a lateral protrusion of the telencephalon in its caudal region (arrowheads). Movie 1. Formation of the anterior intraencephalic sulcus (AIS). Confocal time-lapse showing AIS morphogenesis in a β-actin:GFP transgenic embryo. Dorsal view, anterior to the left. The second crucial event is growth of the telencephalon along the anterior posterior axis of the embryo (Figure 5). With this growth, neural tissue at the caudal pole of the telencephalon bulges into the AIS. This process finally leads to the appearance of the characteristic traits of an everted telencephalon, such as the neural tissue being 'engulfed' by the ventricular cavity and formation of the tela choroidea. Figure 5. Dorsal views of telencephali at 2 (A) and 5 days (B) labelled with the transgene cldnB:GFP. The outlines of the telencephali are overlaid in C (dorsal view) and D (lateral view) to illustrate that most growth occurs along the anterior posterior axis but the mediolateral dimensions alter relatively little. Asterisks: olfactory bulbs; Pal: pallium. We have used our results to propose a model for telencephalon eversion in zebrafish. You can see a simplification of the model in Figure 6. Figure 6: 'Simplified' two step model for telencephalic eversion in zebrafish (you can find the full version in our paper). 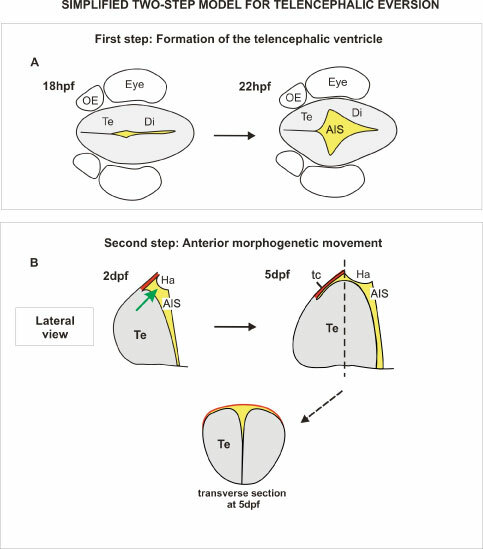 Summary diagrams illustrate the major morphogenetic movements leading to the everted telencephalon in the zebrafish brain. A. First, at around 18hpf, an out-pocketing of the ventricular surface forms the anterior intraencephalic sulcus (AIS) with its diamond shaped roof (not shown here). B. Next, between 2dpf and 5dpf, the telencephalon grows along the AP axis and bulges into the AIS (green arrow). During this phase, the roof of the AIS also expands along the AP axis to form the 'tela choroidea' (the presence of an extended 'tela choroidea' is a characteristic trait of everted telencephali). Transverse section through the level indicated at 5dpf (dotted line) shows that the telencephalon has acquired its standard everted morphology at this stage. AIS, anterior intraencephalic sulcus; Di, diencephalon; Ha, habenula; OB, olfactory bulb; OE, olfactory epithelium; P, posterior; tc: tela choroidea; Te: telencephalon. Although we have now a better understanding of how an everted telencephalon is built in zebrafish, there are questions that remain still open for us. For instance, we would like to test whether the predictions of our model apply to telencephalon development in other ray-finned fishes. Also, we do not have a working model for how neural tube develops into an evaginated telencephalon in other vertebrates. Thus, a lot of work needs to be done to be able to unravel the 'mysteries of brain diversity'. For more information about our paper or our research, contact us directly. This work was supported by the EU ZF-Models programme, the BBSRC, the Wellcome Trust and the University of A Coruna.